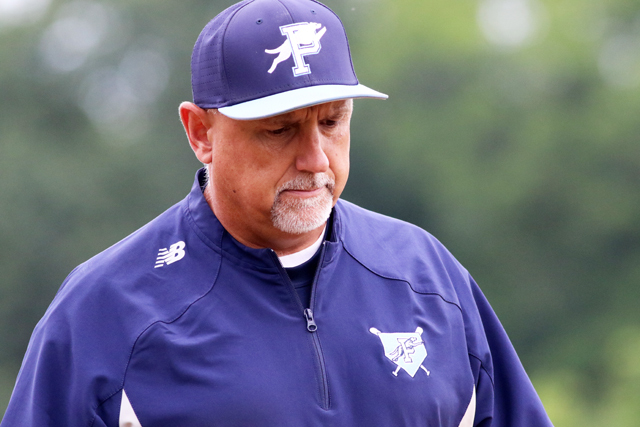 Pope High School baseball coach Jeff Rowland won his 500th career game Wednesday night. Pope High School assistant coach Chris Turco briefly mentioned the milestone. And as usual, it was something that Pope head coach Jeff Rowland didn't want to hear, especially since it was about a personal accolade. The legendary coach won his 500th career baseball game Wednesday on a field appropriately named in his honor. The Greyhounds defeated Northview 11-1 in five innings in a key Region 7-6A contest. Rowland, who has guided Pope to back-to-back Georgia High School Association Class 6A state championships and four state titles in the past 10 seasons, couldn't help but to smile after the game when players gave him congratulatory hugs and several former players posed with him for photos. "It's like I was telling somebody earlier ... maybe when I'm old and I'm sitting in my rocking chair looking out, this stuff may sink in," he said. "But right now we've got to keep working to earn a playoff spot." Pitchers Reid Robertson and Andrew Bowman combined to allow just one unearned runs on four hits. Meanwhile, leadoff hitter James Tibbs put on a show, going 2-for-3 with a triple, a homer and five RBIs. His bases-clearing triple in the second inning helped account for six runs as the Greyhounds (20-5) never looked back. Tibbs also smacked a two-run homer in the third. Jackson Brown also went 2-for-2 with a double and a pair of RBIs to lead the offense. Rowland became the 29th coach in state history to reach 500 or more wins. His career mark of 500-232 ranks him 12th among active coaches. He is the third coach in Cobb County to notch 500 or more wins, joining former Osborne coach Donnie English (716-397) and former North Cobb coach Harvey Cochran (682-348). "I've had some amazing assistant coaches and some great players ... I'm just the one who has benefitted from it," Rowland said. "I've had great parents, great administrators, a lot of good people. I've just been the one who has gotten the credit." Rowland took over the Pope High School baseball program in 1995 and built the Greyhounds into a state power. He was inducted into the Georgia Dugout Club Hall of Fame in 2016. He sports four state titles and his 2016 squad finished as the state runner-up in Georgia's highest classification. Known for his humbleness, Rowland graduated from West Georgia and was an assistant baseball coach at Shamrock and Mt. Zion-Carrollton before coming to Pope in 1995. He has also been an assistant football coach and served as head wrestling coach at Shamrock and Mt. Zion.